The Blizzard of 2016! Wow!!! I cannot get out the back door and I am literally begging for someone with a snow blower to come to my house! 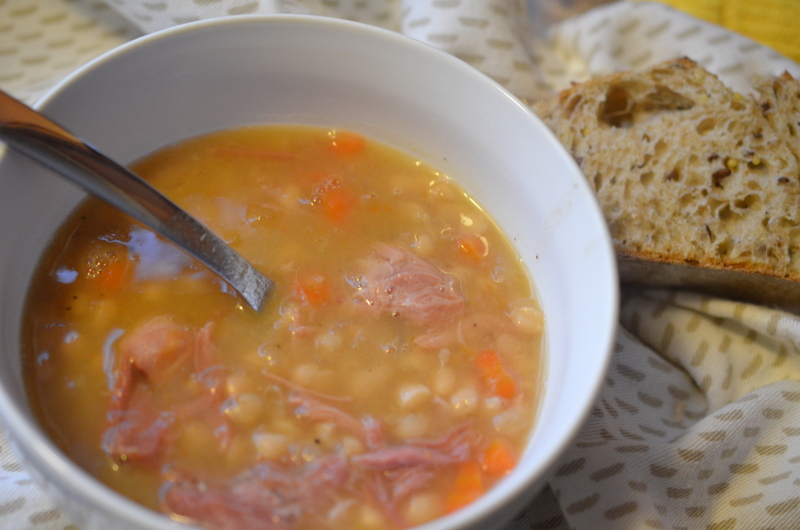 So, since I was stuck in the house it was a fabulous time to make ham and bean soup. I made a huge pot too because both my sons are out plowing all weekend and I wanted them so have some as well. This has to be one of my most favorite hearty soups as well as comfort food! I prefer to use a white bean, I usually buy the white navy beans but the market was out and I found a bag of just a small white bean. I sorted through the beans and picked out a few stones, eww, rinsed them and soaked them in water all night. Since I wanted the soup to ready for the boys by early to midafternoon, I started cooking as soon as I got up, which was pretty early!! I rinsed and drained the beans and set them aside. In my soup pot I heated olive oil and sautéed a chopped onion and diced carrots. Poured in 2 cartons of chicken stock, a ham hock, bay leaf, a little salt and lots of pepper. And that’s it. I brought the soup to a very low simmer, covered the pot and left it do its magic. I did check the soup quite often to make sure it wasn’t getting to a boil, stirred often too. My house smelled so amazing! 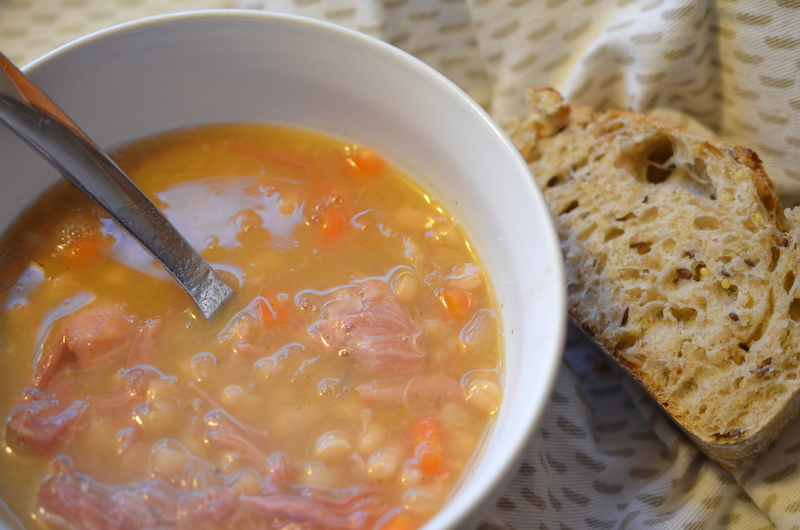 Now, about an hour before I plan to serve the soup I pull out the ham hock and pull any ham off and toss that back into the soup, discard the bones and fat. This ham hock had a good bit of ham on it but I have had some that had very little so I always buy a small ham slice as a back up. I decided to use a little of the extra ham so I cooked it for a few minutes in my cast iron skillet, both sides. The rest of the ham I will save for the boys for sandwiches. Or freeze for later. 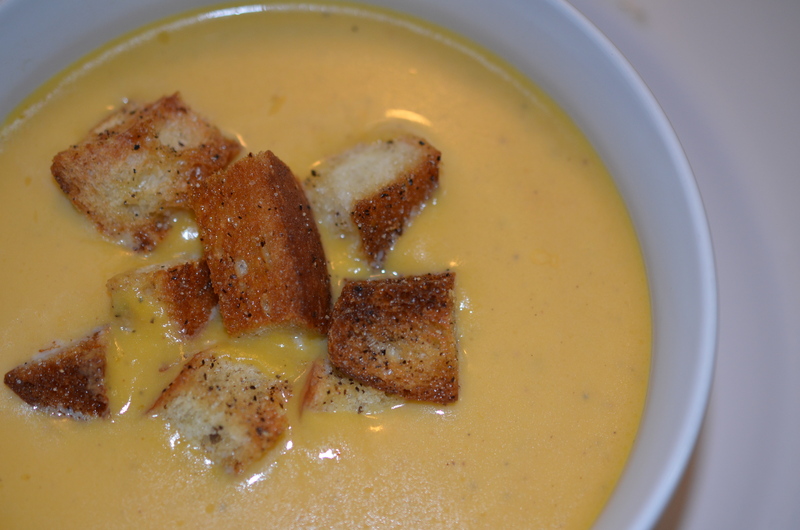 This soup is super easy and full of flavor! Live well! Squash is not one of my favorite foods, so depending on how it is prepared is pretty important!! And being the picky eater that I am….. I never had butternut squash. Ever! So I thought I would start with soup, I began by looking at recipes to see how other folks were cooking it and what I found was pretty similar. The star of the soup is the butternut squash of course, but there is also chicken broth, cream, apples and some spices. How hard could it be!! I decided to roast the squash first. I coated 3 cups of butternut chunks with olive oil and then salt and pepper. Popped them on a foil lined cookie sheet and in the oven they went. They didn’t roast as well as I had hoped but they did get tender quickly. While the squash was in the oven, I diced a small onion and cooked that in the soup pot with olive oil. When the squash was done I added that to the pot too. Sautéed them for a few minutes then added chicken broth, a little more salt and pepper and some onion powder. Brought the soup to a simmer and cooked the squash until it was completely tender. Then out came the immersion blender and I pureed until completely smooth and creamy. I added half and half. A few dashes of nutmeg and then did a taste test. Not bad but it needed something else, it still tasted pretty bland to me but I’m sure lots of you would like it; I just need my squash to have a taste that grabs me! So, I noticed that a lot of recipes used apples. I cheated and added some of my homemade applesauce! My applesauce has lots of flavor with cinnamon, cloves, nutmeg and allspice. I quickly cooked a few carrots and when they were tender I added them to the soup pot along with half of a roasted red pepper (jarred). If I would have had any chipotle peppers I would have added a half of one to the soup as well, I just love that smoky, hot taste in some of my cream soups. 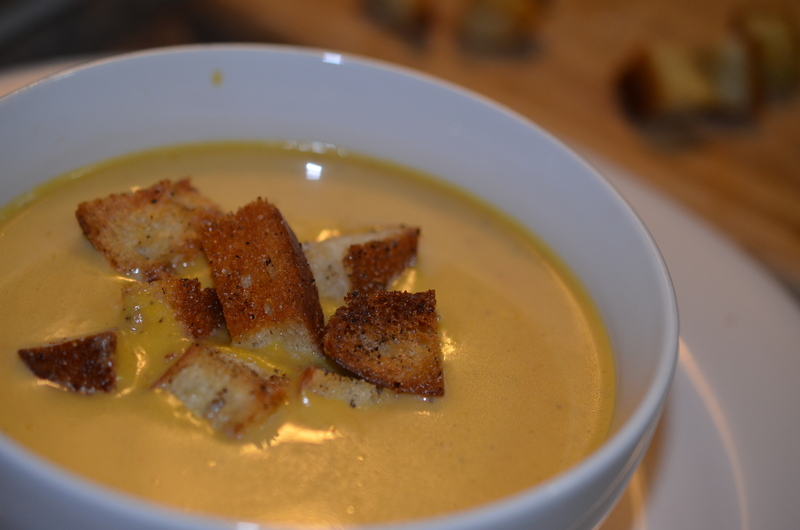 I ran the immersion blender through the soup again. I added a bay leaf, a few sprigs of thyme, and a little bit of brown sugar, left it simmer for about 15-20 minutes. 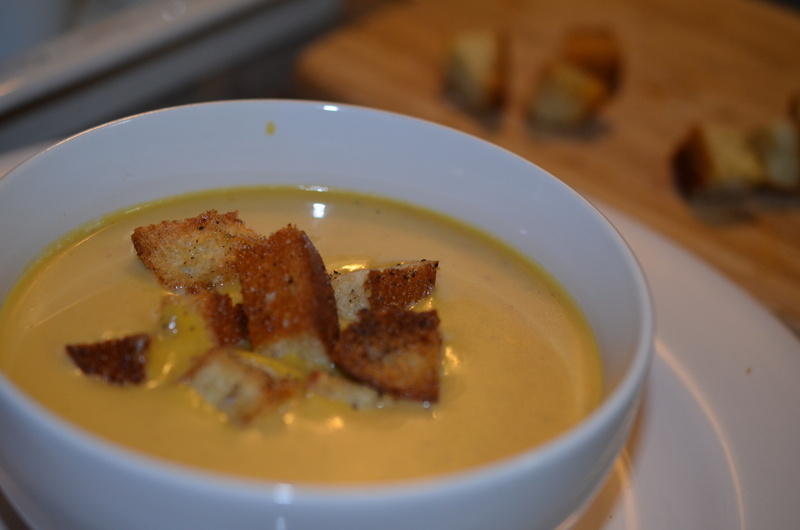 While the soup was finishing up I made a few homemade croutons from some bread in the freezer. All in all the soup wasn’t too bad, definitely not a favorite of mine but I think it’s worth sharing for sure! Be sure to follow me on my Facebook page for random recipes and babbling that doesn’t always make it to the blog!